Place your clean tablecloth in the washer on the shortest cycle in order to make it thoroughly wet (trying to wet it under the sink doesn't work...I've tried it!) Anyway, after the cycle concludes, place the tablecloth in the dryer for 8 minutes on medium heat (I always set the kitchen timer so I don't forget--timing is key here). Take out the cloth and lay over the table. It will be slightly damp but not damp enough to harm the surface in any way. It'll take about an hour to dry completely but you can still set it while it is in the drying process. 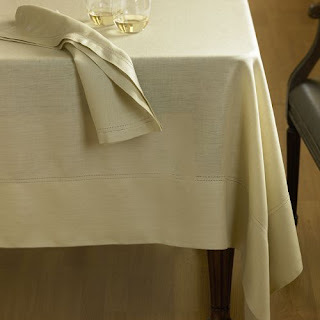 In fact, when you set the table, use the dinner plates, which tend to be heavier, to pull the tablecloth perfectly taut. It will literally appear as flawless as the tablecloth in this picture. No joke. Three cheers for not having to iron, to starch, and for saving yourself a good 30 minutes! Note: if your tablecloth is anything less than a size large, lower the drying time by about 2 minutes. GREAT tip!!! I just struggled with a tablecloth on Sunday. Had the steamer out and everything. Thanks, Steph! Great tip!!! I can see me using this idea for my cloth shower curtain too!I have ironed that thing to death and it still doesn't look right hanging up! COol ideas!! Thank you - I hate ironing my tablecloths and they always have those funny lines in them. I am teaching an enrichment on entertaining tomorrow night and I plan on sharing your fab tip - Thanks!! Note: if your tablecloth is anything less than large, lower the drying time by a couple of minutes!